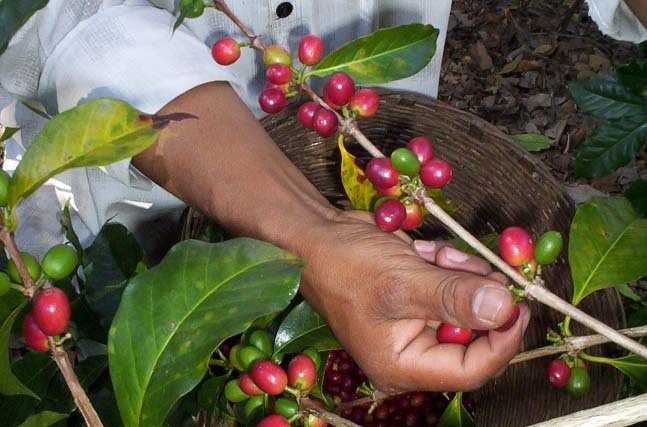 The coffee shrub is divided in two different families: Arabica and Robusta. Arabica, which is considered the highest quality, accounts for about 70% of the world’s production. Arabica varietals grow best in the tropical highlands (between 800 and 2000 meters above sea level) in temperate climates. 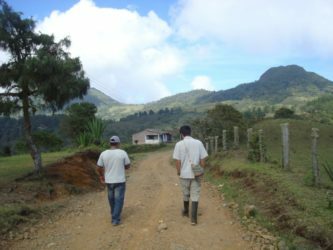 Most Arabica varietals are shade loving, and grow best under a canopy of diversified tree species that not only provide filtered sunlight, but also add to the ecological system that makes up a sustainable coffee growing systems. Robusta, traditionally been used in lower grade coffees, is a more resilient plant of higher caffeine content and can be grown in the lowlands. Robusta coffees generally have a greater crop yield, but a lower market price. 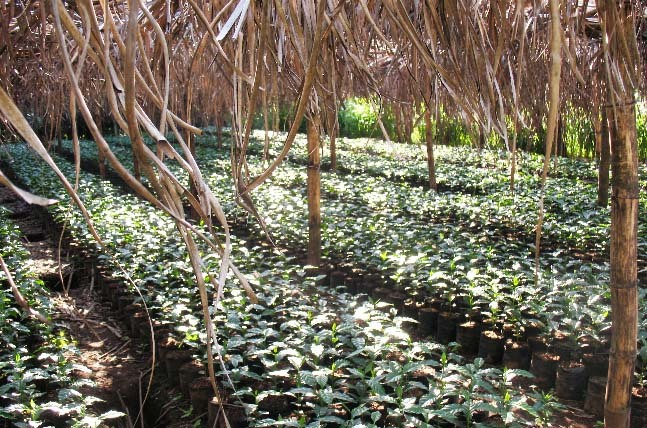 Coffee farmers can either grow seedlings directly in their fields or, as many of the coops with whom we work do, they grow the seedlings in a nursery until the plant reaches a size where it’s sturdy enough to handle the “wild.” It takes between 2 and 3 years of solid growth (and tender-loving care!) 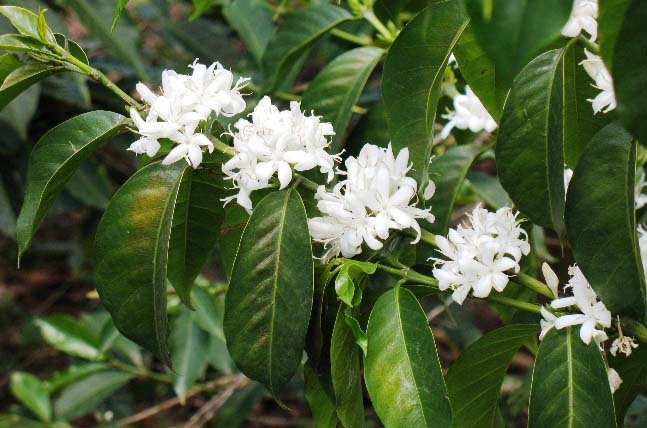 for a coffee plant to start flowering. The little white flowers precede the coffee cherry — the “fruit” of the tree — which will start to form after 6-8 weeks after the first blossom. Each plant goes through one blossom (and therefore harvest) per year but not every blossom sprouts at once meaning that the cherries will mature at different times throughout the course of the harvest. After being picked, the cherry must be depulped to extract the coffee seeds within. The beans are surrounded by a parchment. If the fruit is ripe, a thin, gooey layer surrounds the parchment, called the mucilage. Both the pulp and the parchment need to be removed before the coffee can be roasted. There are two methods of doing this: washed and natural processing. 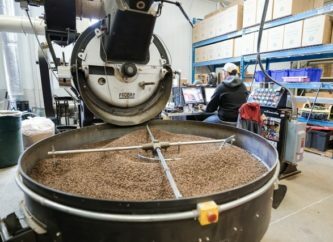 Washed coffees require more processing equipment than natural processing methods, and usually results in a product that is more homogeneous, containing fewer defects. The first step, similarly to natural processing, is preliminary sorting in order to remove all items that should not be there, such as twigs, rocks and unripe/overripe cherries. This is done with screens, and separation through floating in water. The next step is the removal of the pulp from the cherry. This is the primary element that distinguishes washed from natural processing: when preparing natural processed coffees, the pulp is removed after drying on the cherry pod, whereas for washed coffees the pulp is removed within 24 hours of harvesting the cherries. A de-pulping machine is used, leaving only a thin mucilaginous parchment covering on the seeds. After an adequate stay in the fermentation tanks (between 12 – 24 hours, depending upon the ambient temperature and volumes) the seeds are washed to shake off the last musilage, before laying the beans out to dry under the sun on patios or raised beds. Vibrating screens are then used to separate out the beans from any leftover pulp, or poorly depulped beans. The next important step is the removal of the mucilage, the gooey stuff covering the parchment. This is achieved through fermentation of the bean for 24 to 36 hours, during which time the mucilage is broken down by enzymes, and can thus be washed away. Farmers can tell fermentation is complete by feel. Quite simply, once they can no longer feel the slimy texture of the mucilage, it is ready to be washed. Afterward, the coffee is either laid out to dry on huge patios or using mechanical driers, in order to get the coffee down to its optimal 12.5% moisture level. Sun drying can take 8 to 10 days. 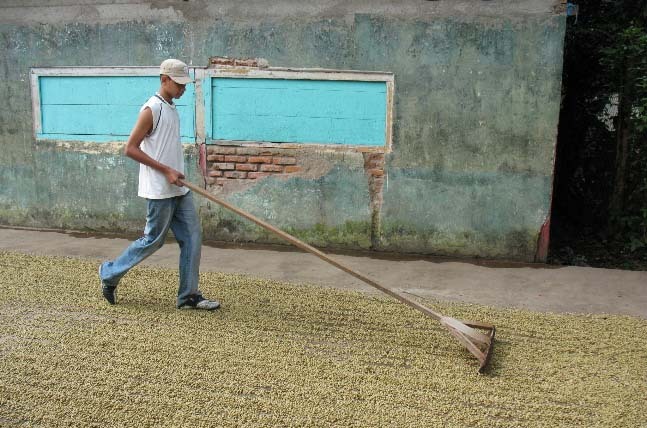 The final step is called curing, which is done just before the coffee is sold for export. The parchment is removed from the coffee beans, and then passed through a series of cleaning, screening, sorting and grading processes. Some use red eye sorting to remove defective beans. At the end of all of this, the grains are poured into large jute bags and prepared for transport. This is the oldest, simplest method, and requires little machinery. Essentially, the goal of the method is to dry the whole cherry, achieved in three steps: cleaning, drying and hulling. First, the harvested cherries are sorted to remove anything that should not belong (everything from damaged cherries to the occasional twig). This is usually done by hand, with the help of a sieve, a process known as winnowing. They also commonly use flotation in washing channels to remove ripe cherries, as these will float to the top. The next, most important step, is the actual drying. The cherries are spread out in the sun, on either huge concrete patios or raised matted trestles. They are periodically turned over by hand to ensure an even drying process. 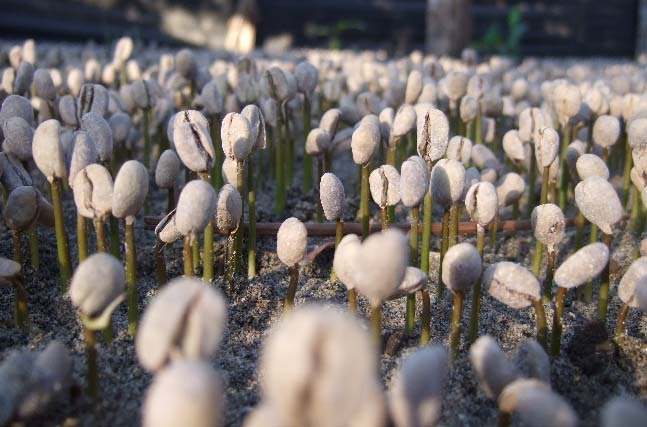 This can take up to 4 weeks, though some larger plantations use machine drying to speed up the process, after the coffee has been pre-dried for a few days. The goal is to get the coffee to its optimum 12.5% moisture level. They need to get the drying just right, as overly dry beans will break apart in the hulling process, and overly moist beans are prone to mold. Next, the coffee is stored in silos until it is sent to a mill, where they will hull, sort, grade and bag the coffee for shipment. The hulling machine removes all the outer layers of the cherry in one fell swoop. After polishing, cleaning, and sorting the grains, the coffee is ready to be graded and prepared for export. At the end of the extensive processing, we are finally left with the green bean which generally has a grassy, earthy aroma. 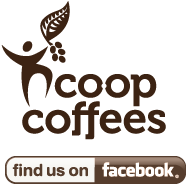 This is the form in which coffee is exported and what we at Cooperative Coffees import. But most people wouldn’t even recognize a green bean as coffee — it’s quite different from the little brown bean they buy, grind, brew and enjoy! Alas, the green bean needs to be roasted before the consumer can properly enjoy it! Roasting allows the bean to reach that rich aroma and flavor that we so often associate with coffee. What is involved in the roasting of the beans? Basically, the beans are heated in a big piece of machinery (the roaster) that spins them around at a certain speed (controlled by the person doing the roasting) at a certain temperature (also controlled by a person) for 8-15 minutes. After a given time, popping sounds indicate that the process well on its way. Depending on the qualities inherent in the green bean, the beans will be roasted for different lengths of time and at different temperatures, resulting in what we call light, medium or dark roasts. Quite simply, a light roast has been roasted for a shorter amount of time, and a dark roaster for longer. Choosing how long and at what temperature coffee should be roasted is considered somewhat of an art form. To get the best quality out of every bean, an experienced coffee roaster will know how to coax it out.